Formula 1 engine builder Brian Hart has died at the age of 77. Hart, born in 1936, fell in love with motor-racing when he attended the 1949 British Grand Prix at Silverstone and his initial involvement with the sport came as a driver. He started out racing in the 1172cc Clubmans formula, dominating the category in 1959. He then stepped into single-seater racing, emerging as a racewinner in Formula Junior, F3 and F2 machinery. Hart's best season in the European F2 championship came in 1967, driving the Frank Costin-designed Protos, which was powered by the Cosworth FVA engine prepped by Hart. He finished 10th in the championship, finishing second to Frank Gardner in the Deutschland Trophy at Hockenheim and setting fastest lap thanks to the aerodynamically sleek bodywork of the Protos. While Hart continue racing until 1972, his attention turned increasingly to engine preparation. He served an apprenticeship with the De Havilland Aircraft Company before moving to Cosworth. Brian Hart Ltd was formed in 1969 and based in Harlow in Essex. Hart specialised in servicing of the FVA engine and also developed the famous Ford BDA powerplant for rallying. Hart also adapted the BDA for use in F2. The engine propelled Ronnie Peterson's March to the '71 European title, with Mike Hailwood winning for Team Surtees a year later. He struggled to raise the finances to take on the likes of BMW and Renault in mid-70s F2, although did re-emerge as a racewinning force in '77 and '78 with drivers of the calibre of Keke Rosberg and Derek Daly. Key to Hart's graduation to F1 was an association with Toleman Group, which approached him to supply engines to its F2 team in '79. That year, Brian Henton narrowly missed out on the title driving the Toleman-run Hart-engined Ralt RT2. In 1980, Brian Henton and Derek Warwick finished first and second in the European championship driving the Toleman-Hart TG280. The next step was grand prix racing. When Toleman stepped into grand prix racing in 1981, Hart built a four-cylinder 1.5-litre turbocharged engine. By his own admission, it was not ready and Henton and Warwick qualified only for one race apiece. Things gradually improved and Hart soon earned plaudits for producing a good engine on a small budget. After failing to score in '82, Toleman finished ninth in the constructors' championship the following year with Warwick claiming two fourth places. In 1984 Hart expanded to supply engines to RAM and Spirit and enjoyed a breakthrough year, with Ayrton Senna also finishing a stunning second in the Monaco Grand Prix for Toleman. The Brazilian added a further two podium finishes later in the year. 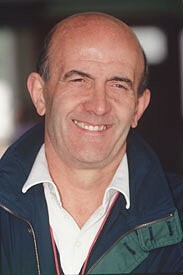 Hart continued to supply Toleman with engines for one more year, with Teo Fabi claiming pole position at the Nurburgring, but the team transformed into Benetton in 1986 and landed a BMW engine supply. After briefly supplying the ambitious Haas team in late-85 and early '86 before the Ford turbo engine was ready, Hart returned to prepping customer Cosworth engines. In 1993, Hart returned to F1 with a 3.5-litre normally-aspirated V10 engine for the Jordan team. After a difficult first season, the partnership excelled in 1994 despite its budget being a fraction of the size of the major manufacturers. Rubens Barrichello finished third in the 1994 Pacific Grand Prix, backing that up with a string of good results, including pole position with a perfectly-timed qualifying run in wet conditions at Spa. Despite finishing fifth in the constructors' championship, Jordan had no choice but to take a works deal with Peugeot for the following season given the commercial value of a factory deal. Hart switched to Footwork/Arrows for the following two seasons, with Gianni Morbidelli finishing third in the 1995 Australian GP, before powering Minardi in '97. Hart's new V10 design then became the Arrows unit used by Tom Walkinshaw's team in '98 and '99. Walkinshaw acquired Brian Hart Ltd, which led to Hart's departure from the sport.